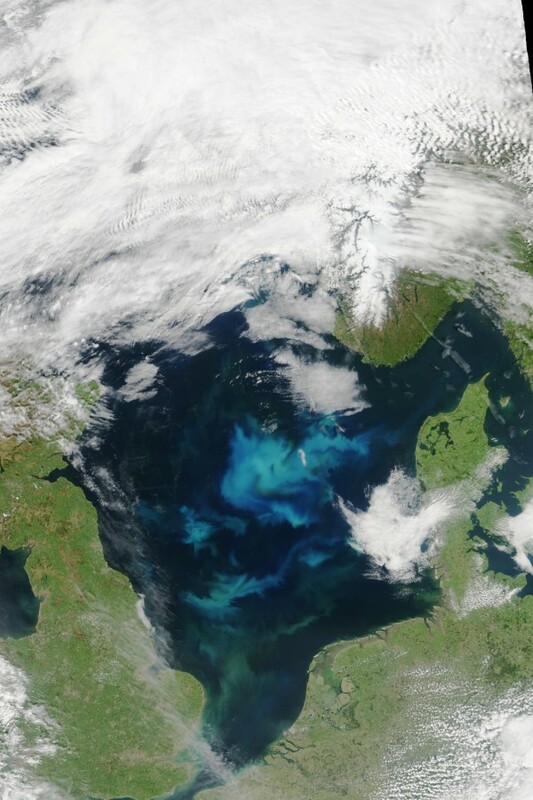 This image, acquired on June 11, 2015, by the Moderate Resolution Imaging Spectroradiometer (MODIS) on NASA’s Aqua satellite, shows a mass of phytoplankton blooming between Denmark, the United Kingdom, and Germany. As compared to a June 6 image showing a different stage of the bloom cycle, areas of concentrated phytoplankton are smaller and most have the milky color characteristic of coccolithophores; there are few to no green areas. The change could be due to the short life span of phytoplankton—two to six days—and differences between the species. Some outlast others because of their ability to survive at lower nutrient levels.